Think before one move, undefeatable. Click on enemy's Mansion or resource plot and select “Attack”, then select your crews and you'll be able to attack. When the crews arrive at the location, they will begin attacking automatically. Before starting an attack, you should first spy the enemy's Mansion or the resource plot (where the crew are busy robbing) to gain information about how many crews&Defense Weapons are there and it can help you decide whether it is wise to start the attack. Upgrading "Radar" can support you with more details when defending or attacking. Items like "Anti-Spy" can be used to prevent your Mansion from being spied for a period of time,thus preventing the enemy from making any sudden move.Also,'False Info' items can also help you give your enemy a false information on your turf to scare them. Click on enemy's Mansion, select “Raid” and choose a Raid time to start an attack with your clan members. Clan members can send out crews to join the Raid.The max amount of crew raiding is determined by the Level of the “Clan Hall” of the one who is start the Raid. Crews sent to the Raid will meet up during Raid time and start marching once the time ends. When attacking a powerful enemy, it would be best to use the Raid. When a member of your clan is being targeted, players can click on that member's Mansion and select “Reinforce” to help that member. The amounts of crews that can be sent as reinforcement are determined by the level of the “Clan Club”. Within Mafia City, your main forces are known as 'Crew'. They are basically your own little gangster. They are divided into 4 categories: Bulker, Biker, Shooter and Vehicle. Each kind of crew's ability can be viewed at the Training interface. Among them, the Bulkers basically acts as shields to take damage, thus when attacking one should send lots of Tank type Bulkers (such as those of Lv. 4, 6 and 7). 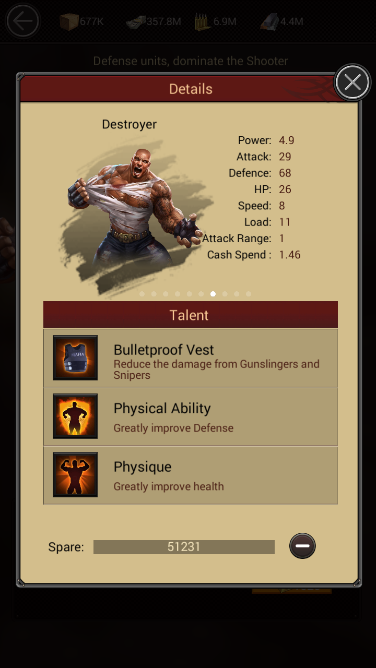 Bikers have chance to attack enemy's range crew, along with talent they can deal a great amount of damage to range crews. Shooters are the damage output crew of the rear, when stationed at the Mansion, with their talents sometimes provide defense bonus. Vehicle's talent provide attack bonus when attacking at the Mansion. When Leader level up, skill point are given, which can be used to unlock Talent. Talents are divided into 3 categories: Battle, Growth and Support. When leveling to a certain stage，points can be allocated to active skill; Such as “Beck and Call” , “Ringleader” and “First Aid”. Hospitals can be built to accommodate the wounded in a battle. The higher the level of the hospital the more wounded it can accommodate. Investing on the “Hospital Expansion” within the “Invest Center”, one can also increase the max amount of wounded it can accommodate. Crews from attacking will die if they are considered loss. Investing on the “First Aid” in the “Mansion Defense” will only turn max 10% of the loss to wounded. During Mansion defense and Resource Robbery, crews will be wounded. If those wounded exceed the max accommodation amount within Hospital, then the exceeded wounded will be considered loss and end up dead directly. Thus it is very important to upgrade Hospitals. When attacking, one can always attack the Robbing Troops so as to limit the available space in Hospital and thus resulting in great amount of crew loss when attacking the Mansion. On the Map there is lots of ruined Prison, which is the starting point for cops during the Cop event. But one can always send crews to explore the prison, since crews within the prison cannot be attacked by other leaders, it is a great method to reduce loss. There are 2 types of Teleport:Random Teleport & Advance teleport. Advance Teleport allows the player to choose where they want to Teleport to. Also when joining a Clan for the first time, that player will also receive 2 Clan Teleport, which will Teleport the Mansion to a place near the Clan Leader. When attacking, one can use the advance teleport to teleport to place near the target, thus reducing target's response time and prevents reinforcement. When being attacked or spied, one cannot use the random teleport so in order to avoid the attack you can use the advance teleport. Truce can be used to prevent leaders from being spied or attacked during the duration it is in effect. It is the ideal method to use when one cannot withstand an attack or will not be able to login for a long time. Please note: Crews outside the mansion will still be attacked even when you have used the Truce item.